This law came to mind this week in large part because I have noticed so much conversation that is the opposite of these 12 characteristics. And that is putting it mildly. Folks are arguing about everything these days in such non-constructive ways. Every person has an opinion that is right beyond a shadow of a doubt. And the rest of the world is living wrong and to be scolded and condemned. I really do not want to get particular about any conversation I have heard, witnessed, watched on TV or read on social media. But I do want to remind us all to consider deeply how we talk about what we believe and the way we live. Sacred texts have plenty to say about how we should engage others, beginning first and foremost with loving one another. Be polite…regardless of age or position. Yep. Manners make it easier for folks to get along. Sounds about right. I wonder if we have forgotten such simple truths in an age where its common practice to rant about the way people live, the way others parent their children, the way some folks dress or the music they listen to…or whatever else does not fit with one’s own way of life. 1 Peter reminds us to always be courteous, polite, respectful and use our manners when speaking about the way we live. You never know when you will be the one that someone lobs an unkind remark towards. And none of us want that kind of dirt to stick. 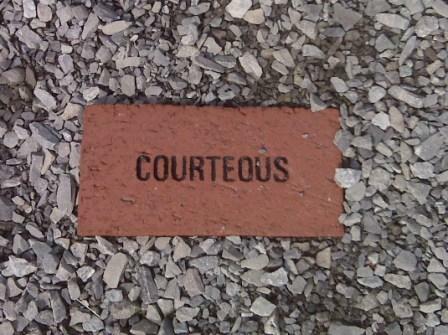 So be courteous. Come to think of it, be trustworthy, loyal, helpful, friendly, kind, obedient, cheerful, thrifty, brace, clean, and reverent, too.